NEW ORLEANS – It might be the middle of winter, but collegiate athletes are heating up on the track and in the field. Here are those athletes who stood out the most during the past weekend and were named National Athletes of the Week by the U.S. Track & Field and Cross Country Coaches Association (USTFCCCA) on Tuesday. Jacory Patterson made his collegiate debut in a big way. Running at home in the Virginia Tech Invitational this past weekend, Patterson smashed the all-time World U20 and all-time U.S. junior best in the 300 with his time of 32.49. That mark also stands as the second fastest time in collegiate history behind Torrin Lawrence’s 32.32 clocking. Patterson also had his hand in the Hokies’ 4×400 relay that got the baton around in 3:12.50 later that afternoon, which stands as the 15th best time in NCAA DI so far this season. He is the first Virginia Tech athlete to be named National Athlete of the Week during the indoor season and just the third male athlete from the ACC to earn the honor. There’s a new queen at 1000 meters in collegiate history. Her name is Danae Rivers. This past weekend at the Nittany Lion Challenge, Rivers scorched the track to the tune of 2:38.58, which broke the former collegiate record of 2:40.79 set by Kaela Edwards. She is the first woman in collegiate history to go sub-2:40.00 indoors in the event. Rivers is the first female athlete from Penn State to be named National Athlete of the Week during the indoor season. She joins Brannon Kidder, who owns the men’s collegiate record in the same event, as the only Nittany Lions to be honored in program history. Eldred Henry got the season started with a bang at the Findlay Open over the weekend as he broke a school record and the Great Midwest Athletic Conference record in the shot put with a best heave of 19.44m (63-9½). The junior’s mark was also a NCAA Division II provisional qualifying performance, the best throw at the NCAA DII level this season by nearly four feet and slotted him as the fourth-best performer in the event across all collegiate divisions this past weekend. Henry is the third male athlete from Findlay to be named National Athlete of the Week during the indoor season. He joins Justin Welch and Taylor Miller, both of whom were honored in 2015. A long layoff was no problem for Caroline Kurgat, who went off and posted the all-time, all-conditions NCAA Division II best in the 3000 after posting a 9:07.05 at the UW Indoor Preview this past weekend. The performance placed Kurgat third overall at the meet behind two professional athletes and is the best mark across all collegiate divisions so far this season and is currently fourth in the world. It was the opening meet of the year for the senior and her first time racing in more than seven months as she was out of cross country eligibility this previous fall. She was quite successful during her last collegiate season, though, as she swept both the 5000 and 10,000 at the 2018 NCAA Division II Outdoor Track & Field Championships. 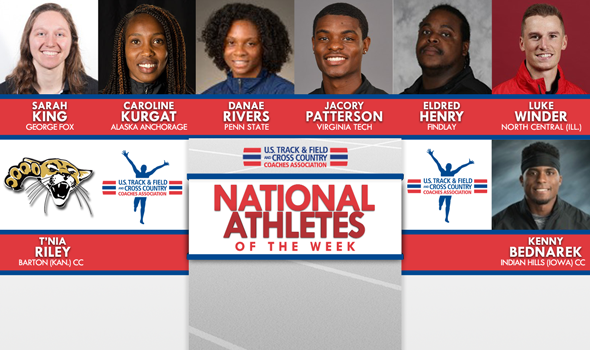 This is the first time that Kurgat has been named a National Athlete of the Week during the indoor season. It is the second time that the Seawolves have been honored indoors (Joyce Chelimo was tabbed NAOTW back in 2016). Winder, who was granted a medical hardship waiver and will compete for just this indoor season, kicked off his last go-round in a big way at the North Central College Cardinal Opener. The native of Joilet, Illinois, matched his best vault to begin a season with his clearance of 5.35m (17-6½). If Winder didn’t already own several top marks in NCAA DIII history, that mark would have tied him as the seventh best performer. Winder isn’t a stranger to being named National Athlete of the Week during the indoor season. This is the fourth time in his career that he earned the distinction, as he was also honored once in 2015, 2017 and 2018. Sarah King delivered a sensational performance this past weekend at the UW Preview. King, running against athletes from NCAA Division I and NCAA Division II, won her heat of the 400 in 55.11. That time, while run on an oversized track, made her the fourth fastest performer in NCAA DIII history. That also bettered her previous PR of 55.24 that she set last year at the NCAA Championships. This is the first time that both King and the George Fox program have received National Athlete of the Week honors during the indoor season. When you post a faster time than two athletes on The Bowerman Watch List, you certainly have caught the attention of the track & field world. Kenny Bednarek continued his stellar start to his collegiate career when he posted a time of 20.60 in the 200 at the Hawkeye Invitational, which was the fastest time recorded in the event across all collegiate divisions this week. In fact, the mark was the best time recorded in the event so far this season by any collegiate athlete. This is also the second time that Bednarek has been named National Athlete of the Week during the indoor season. In the first race of her collegiate career, T’Nia Riley posted the fastest times in the NJCAA in both the 60 and 200 this past weekend at the Jim Green Invitational hosted by the University of Kentucky. Riley placed third in the 60 with a time of 7.41 and followed it with a seventh-place performance in the 200 with a 24.61. The only athletes to run faster than her in both events were from the NCAA Division I level. The freshman becomes just the second female to ever win a National Athlete of the Week award from Barton (Kan.) CC during the indoor season, along with being just the third athlete in total to get selected for the award in program history.